Sale: 20% off for stays only b/w Apr.1 - Apr. 30, 2019. $300 Now $240US P/N! 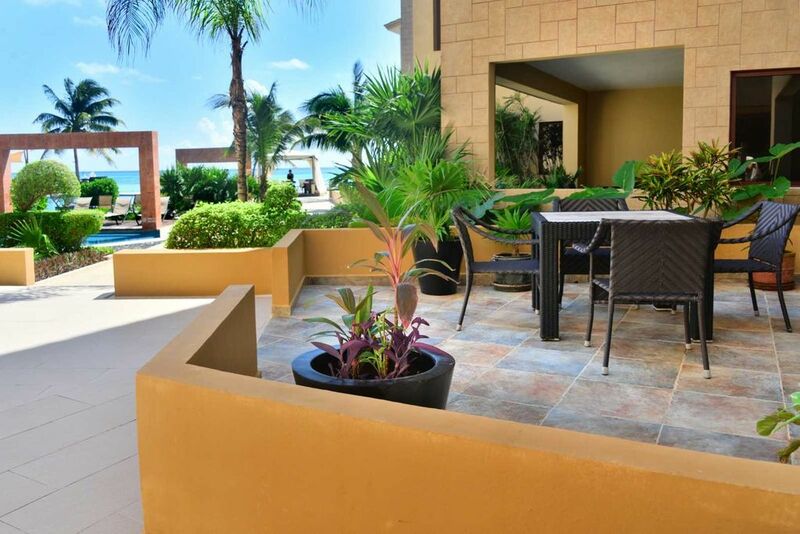 One of the main highlights of our condo is the spacious private terrace with travertine flooring, and partially covered with an overhang for both sun & shade. The patio has lounging furniture (with new cushions), tropical potted plants, and a table & chairs to dine alfresco & enjoy those mesmerizing ocean views! The living area is bright and artfully decorated with a flat screen TV and Sony sound system with a new blue tooth speaker, Sky Satellite TV, & DVD/CD players. The space enjoys elegant rattan couch (new cushions), chair with coffee table. Enjoy the views even from the couch! Slide open your doors to the soft breeze of the Caribbean. A small pull-out sofa bed in the entrance area can accommodate a small person. *fitness center with stationery bike, elliptical machine, treadmill, free weights, universal station etc. Playa del Carmen is an international vacation spot welcoming people from all over the world. A charming sea-side town with a fun vibe. Steps away is shopping, restaurants, beach clubs, water sports, art galleries, spas, boat tours, para-sailing, jet ski rental etc. Close by are ancient Mayan ruins, zip-lining, snorkeling, scuba diving, eco water-parks and more. Playa enjoys a lively day-time beach scene with live music, followed by a laid-back night-time scene with live music, fire shows and candle-light dining by the ocean. Sale Details: For stays between the nights listed above. Rate is discounted and reflected in your rate. Some terms & conditions may apply. *Check in at the front desk to retrieve your keys. *On-site parking is $15USD a day (subject to change). You will need to fill out a parking request form. *Bring pesos with you. Only use ATMs attached to a bank. Do not use street ATMs.